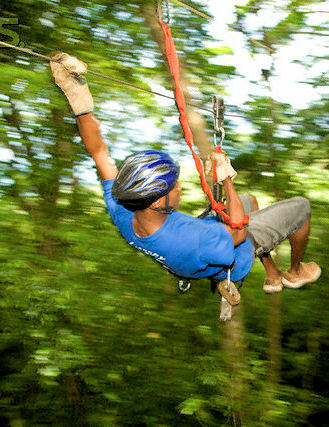 Come experience the zip lines and bird's eye view of both sides of Roatan while sliding through the air. You'll see wild life from the tree tops. Please wear comfortable clothing as you will be wearing harnesses. Be sure your shoes either tie or have straps to assure they will not fall off while zip lining. Maximum weight for the zipline is 300 pounds. You will also want to remember sunscreen, insect repellant and your camera. You will spend about forty minutes ziplining. Travel time is approximately thirty minutes from the Mahogany Bay pier and about twenty minutes from the Roatan pier. Tour times are local time. PLEASE NOTE: Lockers are available for rental at the zip line ($1 each) and the beach ($5 each) prices are subject to change. All personal belongings should be taken with you. Tour operator is not responsible for any items left in unattended vehicles.